The BTnode is an autonomous wireless communication and computing platform based on a Bluetooth radio and a microcontroller. The main development site is on http://www.inf.ethz.ch/vs/res/proj/smart-its/intern/. TecO provides a compilation of Windows tools for a development kit for the BTNode Smart-Its. In particulary we provide the compiler suite and annotations to the Makefiles to get the sources running. All tools run on the Windows native command line, so no cygwin or similiar tools are needed. This gives the developer the possibility to integrate them into an editor of his choice, like TextPad as we do it. Since the hackfest no modification of the Makefile is necessary anymore. This information is outdated since Nov. 4th 2002. The steps in the annotation files were proceeded under a clean Windows2000 installation and to be found as working. For the impatient programmer: DSG's binary distribution with already included Makefile modifications - winbtnode20020909.zip. Instead the STK500 development board we are using the AVR ISP (see also image below). We found a distributorselling it for 35 EUR each. 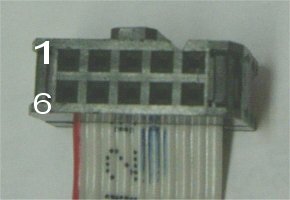 The AVR ISP was tested by TecO and can be controlled by the AVR Studio 4.05 (for Windows - the latest revision under http://www.atmel.com/atmel/products/prod203.htm). AVR Studio can also be controlled from the Windows native command line so it can be integrated into an editor of your choice. While programming make sure that the BTNode is connected to its power supply. Howto download compiled programs to the BTNode? Attention: Before you can download programs you should set the fuse bits correctly. This can be done by using the avrstudio's GUI. The settings and a detailed description can be found on ETH's official BTNode website. Comments are welcome and should be sent via E-Mail to cdecker@teco.edu. 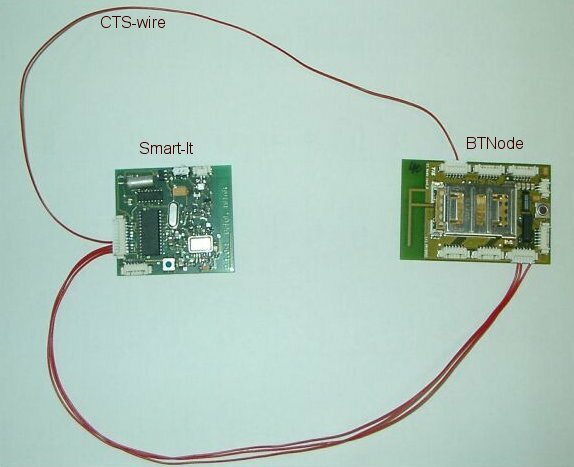 I needed the CTS functionality for my other project (the BT-SmartIt-Bridge), because our TecO Smart-Its make this necessary. I used an external interrupt to provide CTS funtionality to the BTNodes. 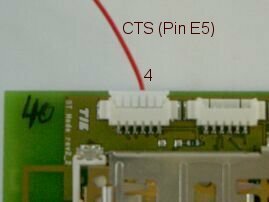 Unfortunately the CTS-pin of the BTNode was no external interrupt pin, so i had to choose another pin for CTS. 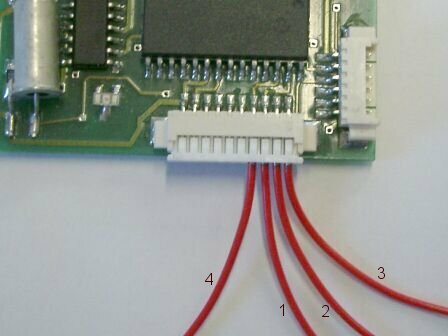 I used Pin E5 (external Interrupt 5) but it would also work with any other free external interrupt pin. I provide this file with my changes in the software section below. You also need a seperate cable for CTS but this should be the least problem. We have developed a bridge at TecO, that sends all data received over RF over UART and, of course, sends all data over RF which are received on UART. I made an equivalent bridge vor Bluetooth. 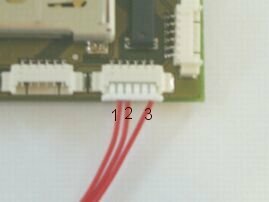 The BT-bridge sends all (UART-)received data to all connected BT-devices (and reverse). So we have a bridge between the Smartit-RF-world and Bluetooth. You can find the source file in the software section. I added CTS-functionality to the BTNodes (see above), because the Smart-It-bridge needs this. 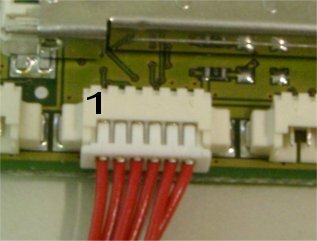 Here are Pictures of the wires/connectors you will need to connect both bridges with my CTS implementation. Comments are welcome and should be sent via E-Mail to weickert@teco.edu. Thanks to Thomas Weickert who is working at TecO intensively on the BTNode Smart-Its.